Arthur John Parsons was born in Milborne Port, Somerset, in 1892. He was the eldest of the eight children of leather parer Samuel Parsons (1866-1918) and Emily née Sutton (b1865). The other children in the family were Ellen Louise (b1893), Bessie (b1894), Amy (b1896), Christina (b1899), Alice (b1900), Louisa (b1904) and Harry (b1906). The family were still living in Milborne Port at the time of the 1911 census, at which time 19-year old Arthur was working as a leather glove cutter. He was also a Sunday School teacher and a Sergeant in the Wesleyan Boys' Brigade in the Wesleyan church at Milborne Port. The family moved to Yeovil, setting up home at 22 St Michael's Road, Pen Mill. Arthur became a member of the Vicarage Street Wesleyan Chapel and also joined the Pen Mill Adult School. When war broke out, Arthur was working in the north of England but returned to Yeovil to enlist around the beginning of 1916. He joined the 17th Field Ambulance, Royal Army Medical Corps. His Service Number was 53827. The 17th Field Ambulance, Royal Army Medical Corps served with 6th Division, they proceeded to France on 10 September 1914, landing at St Nazaire. Then marched at once to the Aisne to reinforce the hard-pressed BEF. They moved north to Flanders and were in action at Hooge in 1915. In 1916 they were again in action on the Somme battlefields. 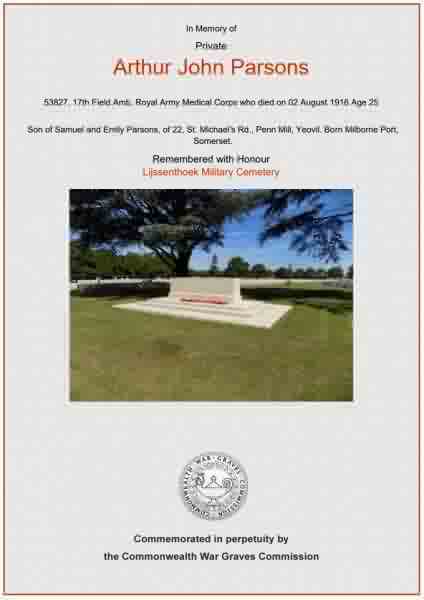 Sadly, on 2 August 1916, Arthur was accidentally drowned while bathing. He was 25 years old. The Western Gazette's edition of 25 August 1916 reported "On Tuesday afternoon, Mr and Mrs S. Parsons, of 22 St. Michael’s Road, Yeovil, received notification from the War Office of the death of their eldest son, Private Arthur J Parsons, of the R.A.M.C., British Expeditionary Force, the cause of death which occurred on August 2nd, being “Accidental drowning.” Accompanying the notification was a letter signed by Mr D Lloyd George, Secretary of State for War, expressing the deep sympathy of the King and Queen with the family in their sorrow. The late Priv. Parsons, who was 25 years of age was by trade a glove cutter. He was a native of Milborne Port, where he actively identified himself with the Wesleyan Church, and was a Sunday School teacher. He was also a member of the Wesleyan Boys’ Brigade, being a sergeant. On the family’s removal to Yeovil he became a member of the Pen Mill Adult School, a movement in which he took a keen interest. He was also a member of the Vicarage Street Wesleyan Chapel. At the outbreak of war he was working in the North of England, but about six months afterwards patriotically offered his services to his King and country, and was accepted for the R.A.M.C. He subsequently went to France, and his frequent letters showed that he was doing excellent work amongst the wounded. His death will be regretted by his many friends in Milborne Port and Yeovil, by whom he was held in general respect and esteem." 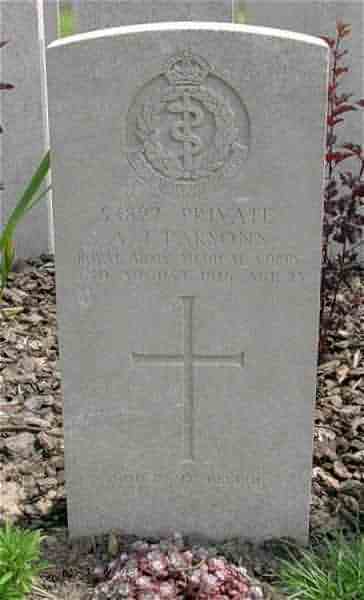 Arthur Parsons was interred in Lijssenthoek Military Cemetery, Poperinge, Arrondissement Ieper, West-Vlaanderen, Belgium, Grave VII.D.18A and name is inscribed on the War Memorial in the Borough. Arthur Parsons' Commonwealth War Graves Commission headstone. The Commonwealth War Graves Commission's certificate in memory of Arthur John Parsons.